In a special promotion only a youth hostel could afford, the Serre Chevalier Hostel in the village of Bez, southern French Alps near the Italian border, is welcoming Hostelling International members with a top value full-pension package. The hostel, a recently renovated collection of three stone houses, is near the base of a popular ski and snowboarding resort called Serre Chevalier so the package covers only room and board, leaving your family free to customize their experience. Snowboarding at Serre Chevalier. photo c. Serre-Chevalier Tourism Office. The reion is beautiful, the mountain resort’s altitude goes from a base village at about 4,400 feet to a peak of 9,240 feet. There are 250 kms of groomed trails for alpine skiing, for all levels of fun — more than a hundred trails are divided between beginner and intermediate runs. The surrounding Parc national des Ecrins and 10 kms of the Parc naturel régional du Queyras trails make hiking or snowshoeing easily available, too. The auberge de jeunesse or hostel itself is only a quarter-mile from the Serre-Chevalier station or base village, where you’ll find a movie theatre, discothèque, karaoke bar, groceries, ice skating rink, indoor pool, and fitness gym to keep the teens busy. Within the hostel compound you’ll find great camaraderie, a ski/snowboard equipment rental shop, WiFi, laundry, a disco and karaoke for evenings, and special meals. 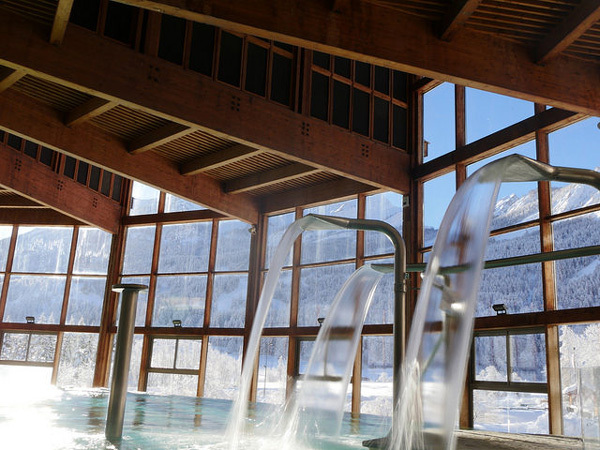 At Les Bains de Monetier, hot springs are pumped indoors for guests to enjoy. If your family is ready to join other snowsports fans in the casual, 130-bed dorm-like environment, you’ll get a bargain snow sports vacation. Families can opt for rooms with 4, 6 or 7+ bunks in them. There is a 10€ daily supplement for double rooms and all rates include full board: a hot breakfast and dinner at the hostel. Children ages 5 and under pay 50% of the adult rate; ; kids from 6 to 11 can take 20% off the week-long package. Note that all hostel guests will get discounts on lift tickets, ski and snowboard rental gear (helmets available for all ages). A complimentary shuttle bus transports guests to the lifts and around the resort. Beyond Serre-Chevalier, the surrounding French mountain villages are charming. You can plan a daytrip to one of France’s most beautifully intact medieval towns Briançon, whose fortifications at Vauban are a UNESCO World Heritage Site. Another nearby activity is Bains aux thermes de Monetier le Bains — a hot springs resort in Monetier le Bains. For more ideas on value skiing in North America or Europe, check out FTF’s roundup of the top family mountain resorts. 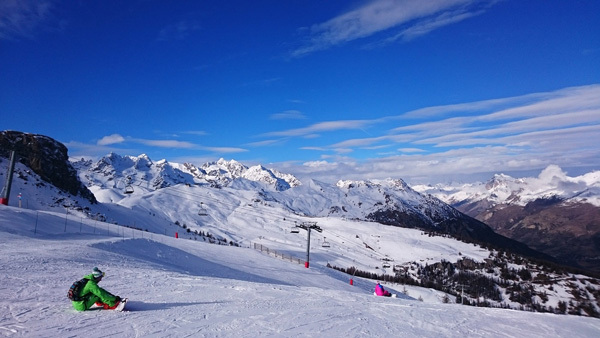 The Serre Chevalier – Briancon Hostel is located at “Le Bez,” P.O.Box 2, 05240 – Serre-Chevalier 1400 France. Call them at +33(0)4 92 24 74 54 or check out their site for other specials on sports like speed skating and cross-country skiing.